A South Central Los Angeles mural of the city’s history. 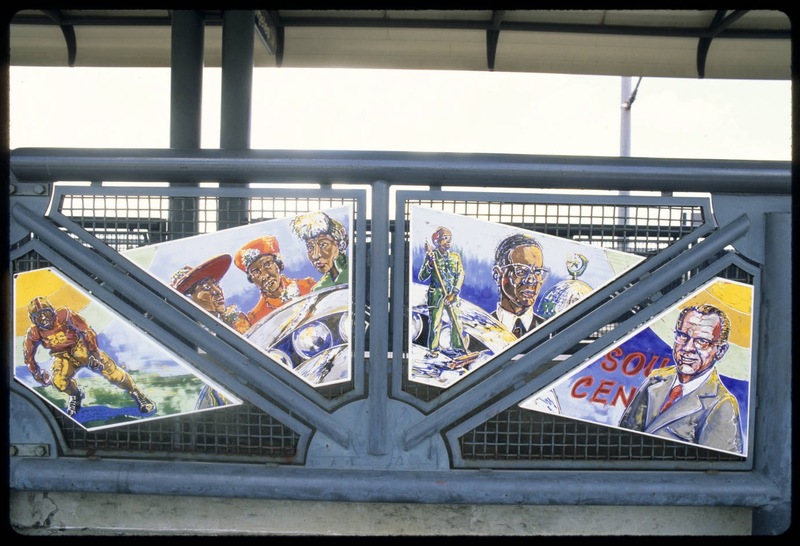 Healy, Wayne and David Botello, Ricardo Duffy, and Robin J. Dunitz, “South Central Codex and Slauson serenade,” Digital Public Library of America, http://dp.la/item/b4adc12e6b74c02ee190f7fd9ba2c85a. Courtesy of University of Southern California Libraries. An interview with Melvin Longclaws about the US-Dakota War of 1862. A poster created in 1998 about the effects of manifest destiny on California’s communities of color. Westward the Course of Empire Take Its Way, an Emanuel Gottlieb Leutze mural created in 1861 for the capitol in Washington, DC. An ornamental map of the US and Mexico created by Humphrey Phelps in 1846. An excerpt from Mistress of Manifest Destiny: A Biography of Jane McManus Storm Cazneau, 1807-1878. An excerpt from Esther: A Story of the Oregon Trail by Mrs. Anne S. Stephens, written in 1862. Letter from A.D. Covin to George Carmack in 1962 criticizing US expansionism. A mannequin of a Mexican soldier in 1846. A 1964 photograph of the “This is the Place” state monument in Salt Lake City.